Whether it’s carbon steel or stainless steel, your welded seam will usually need to be ground. Here is our guide to weld grinding, blending and finishing. Particularly with carbon steel, mill scale is formed during its manufacture. Before welding takes place, it is generally good practice to remove this scale as it can interfere with the quality of the weld. The Megaline Flexclean disc is the perfect choice for removing scale without damaging the surface of the metal. MIG welding or Gas Metal Arc Welding is a very productive and low cost method of welding metal. MIG welding is generally considered to be the best for thicker items but will produce a prominent weld seam. TIG welding or Gas Tungsten Arc Welding by comparison is generally more precise -involving a tungsten electrode to form the weld. The outcome is a neater, smaller weld and this is part of the reason that it is commonly used on stainless steel. Not all welds need to be removed for the metal to be functional. Carbon steel for instance is usually either painted or left unfinished, so where the seam is not going to be visible and/or of structural importance, grinding the weld might not be necessary. Unfinished welds are stronger as the material fusing the pieces together does not have any of its stock removed and thus its integrity is not affected. In the majority of cases, the carbon steel needs preparing only to the extent where it can be painted, therefore well scratched surface will improve the adherence of paint to the metal surface. Where powder coating is being used, only a coarse grained 2-step process will be enough. Stainless steel is, by its nature, a stronger ‘pound-for-pound’ material than carbon steel and when it comes to use, has a much thinner gage. These features have implications for the grinding process. Stainless steel is ubiquitous throughout commercial applications and the surface finish selected determine how the material is to be used. A refined finish might selected for its appearance whereas an elevator wall panel or hand rail must have a No.4 finish to disguise the visibility of fingerprint and scratches; thus a more functional finish. Remember to keep the two materials separate in the finishing section of your workshop to prevent any risk of cross contamination. This is particularly important when you are transitioning from carbon steel to stainless steel. For the two different types of steel, the first stage of grinding a weld is the same – removing the stock from the weld itself. The aim here is to grind the weld down to a level that is continuous with the rest of the parent metal. For the initial stock removal, and if the surface finish is not essential, the user might opt for a grinding wheel and an angle grinder. A grinding wheel can certainly be used on both materials for this initial process but it would take a high level of skill to achieve a good quality result on stainless steel. Pitfalls such as gouging and undercutting can be experienced, so care must be taken to ensure the right angle is adopted when grinding. Grinding wheels are the clear choice for carbon steel applications. These products will remove the weld seam with ease and importantly, since the appearance of scratches are not so much of an issue compared to stainless steel, they are ideal for this operation. A grinding angle in the 5 to 35 degrees to the horizontal (depending on the grinding wheel used) range should be adopted. Apply continuous pressure in both directions to achieve an even finish. 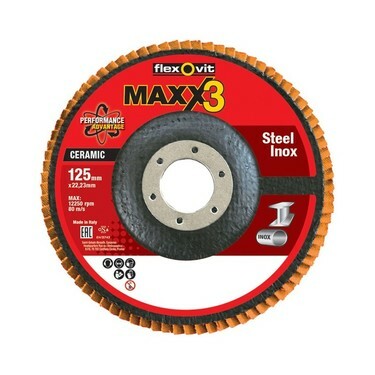 A grinding wheel with a ceramic grain such as the Flexovit Maxx3 will be more than up to the job. As previously stated, using grinding wheels on stainless steel requires a skilled operator to achieve a suitable finish. Many people would instead opt for a fibre disc or flap disc to complete this work on stainless steel. If, however you choose to work with a grinding wheel, select one that is suitable for the material – this information is available on the disc blotter, look for non-ferrous (iron-free) and/or appropriate for inox. Even at this first stage, use a medium grit rather than the coarse option. The scratches will be easier when we come to blend at a later stage – particularly important when you are looking to create a refined finish to the weld. Additionally, as stainless steel has a thin gage and you are at risk of creating noticeable flat spot when using a coarse grain at this stage. These flat spots will be very noticeably on tubular shaped pieces. The grain size, type of grain and the bonding agent also dictate how the product will operate when in use. Ensure you have a clear idea on what you are trying to achieve and the type of product you require before starting up your angle grinder! A flap disc is always a logical choice when you have a weld to grind. Whether it be for stainless steel or carbon steel, these products offer some key benefits such as long product life, great comfort, sound operator control (which generally gives the operator more room for error), relatively low noise, and the high quality surface finish. A P40 coarse gritted flap disc will have no trouble removing any carbon steel weld seam quickly and easily. The metal will then be primed for further conditioning, before it is eventually painted. Operators should typically opt for a flap disc where a higher quality, more refined surface finish is required - particularly for stainless steel. A flap disc from the Flexovit Maxx3 range would be the obvious choice for this process. An experienced operator would select a disc in grit P80 and we would recommend P120 for those who are less experienced. A shaped workpiece can be a notoriously difficult job to grind and finish with a right angle grinder. To make this job more straightforward, we will be launching our curved flap discs soon. These discs feature upward pointing flaps that allow the operator to work at 90 degrees to the weld. Watch this space for updates! If you are powder coating your carbon steel, your work is nearly done. Just one more blending stage is required with the Flexovit Megaline Flexfinish in a coarse grade. Powder painting is thick enough to mask the appearance of the scratch created by the abrasive and it readily adheres to the surface of scratched carbon steel. If the paint layer is thinner than powder coat, then you may need to refine the scratches a little further so that they don’t show through the final layer. Here, we would recommend a medium grit conditioning pad. A highly refined finish or even a number 4 finish, stainless steel would certainly need further conditioning and blending after the first stage. The initial scratch would look unsightly on a stainless steel surface, to blend this out, we would once again recommend the Flexovit Megaline in a medium grade. This non-woven abrasive imparts a consistent, smear-free finish to the metal but if this is still not fine enough for your requirements, further refinement can be achieved with a Flexovit Speedoflex Flexfinish 2SF disc. The soft material combined with fine silicon carbide grain imparts a smooth bright finish to the surface. There are a number of options available, details can be found our new 2019 Flexovit Industrial Catalogue. For carbon steel, the surface is now fully prepared in anticipation of it being painting or being used for its intended structural purpose. For stainless steel however, further steps are required to achieve the finer finishes. The information we present from this point onwards is only relevant to stainless steel. The decision over which finish to choose for your stainless steel workpiece depends entirely on what the final product is going to be used for. A bright and homogenous finish can be achieved relatively easily from this point on. To blend out the remaining surface scratches left by the previous processes, we recommend using the Flexovit Rapid Blend NEX-2SF. A fine grade silicon carbide abrasive that will give the stainless steel a bright, highly refined-looking finish. This disc is best used at a 10-15° angle and is moved slowly across the steel, using the weight of the angle grinder for pressure. This finish should leave the seamless shine you require, but if you want an even glossier looking shine, consider using a felt polishing disc such as our Industrial Line Flexpolish. A number 4 finish is a specialist stainless steel finish that is commonplace in the commercial setting and cannot be obtained by a rotary abrasive. Its linear looks are achieved with an abrasive belt or wheel. In the context of this article, our previous stage is substituted by a P80 - P120 gritted abrasive belt, followed by a Rapid Prep medium grade non-woven belt, before finally being finished off by a very fine non-woven belt. When imparting any specific finish to stainless steel, you are looking to only remove a minimal amount of the surface metal without impacting significantly on the overall thickness (and thus its strength). It is important to only sand in one direction where the linear effect is required. Number 4 linear stainless steel is usually present in high traffic areas where there is a high rate of wear and tear, such as shopping centres and schools. Its use in commercial areas is down to the material’s low maintenance, long life, anti-fingerprint, and damage concealing properties. Please note that on flat surfaces we would need a Satinex machine with belts on a pump sleeve or interleaved Satinex wheels (p80 coated flaps with a coarse grade non-woven), and for tubes, abrasives belts on a tube finishing machine. More information on any of the Flexovit products described in this article, please refer to our new 2019 Flexovit Industrial Catalogue. As always, our Flexovit Experts are also happy to any questions you may have, just contact us using our web form. Watch Tamas one of our application experts answer some of our customers’ most frequently asked stock removal questions! Watch Paul one of our application experts answer some of our customers’ most frequently asked finishing questions! Watch Derk one of our application experts answer some of our customers’ most frequently asked grinding questions!